Since its inception, the Monterey Jazz Festival hasn’t just been about bringing in some of the nation’s most iconic jazz musicians to its annual event in the fall. It’s also been fostering a younger generation of peninsula musicians and supporting jazz education from its summer camp to its traveling clinicians to April’s Next Generation Jazz Festival. 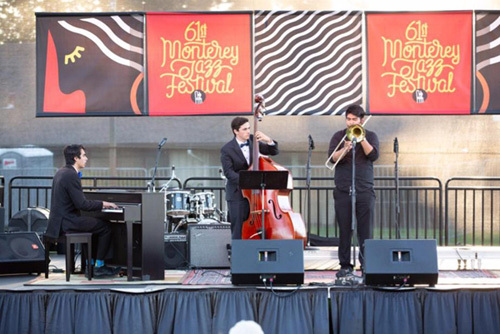 From April 5-7, the Monterey Conference Center and four other “Spotlight Stages” will host competing middle, high school and collegiate jazz groups of every kind—combos, vocal ensembles, vocal soloists, conglomerate bands and orchestras—with the grand prize being an invitation to September’s Monterey Jazz Festival. Carmel High School, whose jazz ensemble will perform at Portola Hotel’s DeAnza Ballroom at 12:30 p.m. Saturday, has benefitted from many of these programs. Students have attended free clinics and Monterey Jazz Festival summer camp, and MJF’s Gaw Vang Williams has worked with CHS’ chamber choir. In total, there are six Carmel High students in MJF’s High School All-Star Band and five in MJF’s High School Honor Vocal Jazz Ensemble. Pascale Montgomery, a junior and a member of the CHS chamber choir, says she has enjoyed being a member of the Jazz Ensemble, directed by Janice Perl and Rob Klevan. For Montgomery, working with esteemed professionals at MJF is something she used to take for granted, but she now realizes how much they’ve helped her gain invaluable skills as a musician. Though Montgomery felt it was difficult to find opportunities in vocal jazz in middle school, it was through MJF programs that she was able to access jazz education in their summer camp. When Montgomery saw her brother and his friends involved with MJF’s programs, she immediately knew she had to attend the MJF summer camp until she could sing with CHS’ jazz band and join the MJF High School Honor Vocal Jazz Ensemble. Of the 160 free events of the Next Gen Festival featuring about 1,300 student musicians, the competition to perform in September’s Jazz Festival will take place in the Monterey Conference Center while four “Spotlight Stages”—Portola Hotel lobby, Portola Hotel DeAnza Ballroom, Dali Expo at the Custom House Plaza and Turn 12 Bar and Grill—will host non-competing groups. Senior Aaron Georis, a bassist who will be playing at such locations at the festival, has attended MJF’s summer camp since sixth grade and now works there as an intern. Though he’ll be playing at the Next Gen Festival with multiple groups, including the CHS jazz band, MJF All-Star High School Band and with Trinity Christian High School’s band, Georis explains that he’s most excited to hear from college groups coming so he can get a better idea of what playing jazz will be like when he goes to college next year. Georis further says that playing in the MJF’s honor groups and getting gigs like Next Gen has helped him in ways that school can’t. Though most non-competing groups like the All-Star ensembles and most competing high school groups hail from California, some college groups come from as far as New York’s Columbia University, and one high school big band will be coming from Copenhagen, Denmark. NGJF has groups representing three countries, 13 California counties and seven schools from Monterey County. The diversity at the Next Gen Festival is just one example of the global impact the Monterey Jazz Festival has. Many of the artists performing in September come from many parts of the world, and high school All-Star ensembles have gone as far as Japan for performances. In addition to student performances, judges who will assess the competing groups over the weekend will perform a concert open to students and the public for free Friday at 7 p.m. at the Monterey Conference Center’s Serra Ballroom. For more information on the dates, times and locations of performances in NGJF, see MontereyJazzFestival.org.